Massacre X, the revamped version of Massacre featuring Rick Rozz, Kam Lee, Michael Grim, and Mike Mazzonetto, have announced their first live show. The band will perform at at the Protzen Open Air Festival in Protzen, Germany on June 24. It was recently revealed that Rick Rozz and Kam Lee reunited to launch a new version of Massacre, along with The End’s Michael Grim and Mike Mazzonetto. The group were planning to go under the name Massacre X (silent X to signify their 10th lineup), but now Bill Andrews is saying that they can’t use the name. Rick Rozz and Kam Lee have reunited to launch a new Massacre lineup. 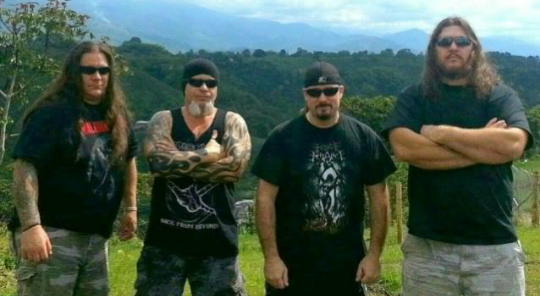 The latest incarnation of the band includes them along with The End’s Michael Grim and Mike Mazzonetto. The group will go under the name Massacre X (silent X to signify their 10th lineup). After the public announcement of the departure of previous Massacre bassist Terry Butler, and vocalist Ed Webb in 2014, which brought to a close a 4 year run of that lineup. Now nearly 2 years later a recent resurgence of the band has been reactivated, when The End bassist/vocalist Michael Grim (Death Before Dying) drummer Mike Mazzonetto (Massacre/Pain Principle) and guitarist Rick Rozz DeLillo (Mantas/Death/Massacre) have joined forces with original “From Beyond” vocalist Kam Lee (Mantas/Death/Massacre/Bone Gnawer/The Grotesquery) to reform this newest incarnation of Massacre. The band’s main objective is to rekindle the original sound, style, aggression, and passion that originally elevated the band to cult status in the rise of the death metal scene in the early 1990’s. The management representation and booking agents in place are working on tours for the U.S.A, Europe, Latin America, and other areas worldwide. The bands plan is to tour the “From Beyond” album, along with a few old classics from Mantas/Death. According to Blabbermouth, Massacre have officially disbanded, after both Ed Webb (vocals) and Terry Butler (bass), announced their departures. Due to the circumstances, the band will no longer be apart of the European Death DTA “Symbolic” 20th anniversary tour and will no longer be playing the last show on the Swamp Leper Stomp ’14 tour. “After much thought and consideration it is with deep regret that I announce my departure from Massacre. This was not an easy decision to make but a necessary one. The last four years have had its share of both unbelievable times as well as some times I wish to forget. I want to thank all of the Massacre fans, those who accepted me as the new vocalist as well as those who didn’t. You guys gave me the desire to work harder than I ever had in the past. I also had the privilege to play some of the most incredible shows, do some killer tours and meet a lot of great people along the way. As previously stated, the band will no longer continue, due to the departures, leaving Rick Rozz and Mike Mazzonetto to continue on with a new project.